The Force UDI drone is a cheap feature packed option for drone enthusiasts and beginners. It comes at a fairly reasonable price of under $150 and comes factory assembled with a controller, a VR headset, 2 batteries, USB battery charger and an SD card reader along with a 4gb SD card. The Force UDI boasts a 720p 2MP HD camera, which can live stream videos to your smartphone or tablet. The drone is FPV (First person view) and VR compatible, which allows you to view your flight in first person with the help of the drone’s self-generated Wi-Fi. It also comes preset with altitude control and custom flight path software which allows you to chart out the route on your phone using a special app. The drone can be fixed at a particular altitude, and can even fly headless ( the pilot can fly the drone to any regardless of the direction the drone is facing). The flight time of the drone ranges from 7 to 12 minutes depending on whether you’re recording or streaming videos. The range of the drone is 328 feet, as well as a maximum SD capacity of 16GB. The one button landing/take off feature removes the danger of crashing your drone while you try to make it land. The FPV feature is a unique feature that is rarely found in other drones at this price range. Another feature built in is that of the drone flies out of range, it will gradually descend till it lands, unlike some other drones that go crazy. Due to the low weight (5.4 ounces), you don’t even need to register it with the FAA. The custom flight path allows you to chart out a route on your phone so that the drone can fly unassisted. The altitude control is a very useful feature too, as it allows you to prevent your drone from flying into fences, buildings etc. The light weight of the drone makes it very susceptible to severe damage in the event of an accident. Wind speed plays a much larger factor when flying the Force UDI. 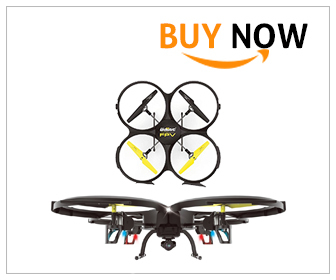 A strong wind can easily blow it away, and unlike some other drones at this price range, it does not come with the ability to be fixed at a particular location, which would have remedied this. The VR streaming, while a cool feature can lag and stutter at times. The camera is quite underwhelming with only a 2MP resolution. It can only shoot or stream videos at a max of 30fps, which in today’s world is quite inadequate. For drone for enthusiasts and beginners, the Force UDI is highly recommended as a moderately priced drone with some very unique features like the VR streaming and easy to use functions like the one button landing take off. But if you need high-quality photos or videos, or a drone with a sturdier build that can withstand high wind speeds, you should look at other options.